Editor's Note: March 12, 2012 - This article was originally published on September 26, 2011 regarding a murderous land grab made by Ugandan dictator-for-life Yoweri Museveni on behalf of a British corporation masquerading as a "green" humanitarian enterprise. In the wake of the KONY 2012 fraud, Land Destroyer believed it was essential that the plight of some 20,000 Ugandans displaced, some murdered by Ugandan troops, be reiterated - in hopes of highlighting the absurdity and double standards being applied by the corporate media, Hollywood, and various mouthpieces throughout Western government in regards to Africa and around the world. Real injustice as well as the real perpetrators must be fully exposed. There is REAL genocide being carried out in Africa, and the face of the perpetrator is not merely Joseph Kony and his child-soldiers, it is Museveni and his child soldiers, as well as corporate-fascists like Robert Devereux of the UK who had tens of thousands displaced while making deals to prop up brutal dictators like Museveni. The difference, aside from the vast scale of Museveni's crimes compared to Kony, is the fact that Museveni gladly serves Western interests, while Kony serves more conveniently as the latest in a long line of "boogeymen" to cover up the ongoing Western plunder of Africa. Image: Ugandan "President-for-Life" Yoweri Museveni and British corporate-fascist Robert Devereux (over his shoulder) are recent collaborators that saw the Ugandan military displace 20,000 people from their land so Devereux's corporation, "New Forests" could plant trees where once they wrought their livelihood from. Strangely, this seems to have been overlooked by "Invisible Children." Beneath fraud, media spin, & UN stamps of approval, awaits an unfolding nightmare for the people of Africa and the world. September 26, 2011 - The New York Times recently reported in an article titled, "In Scramble for Land, Group Says, Company Pushed Ugandans Out," that the British "New Forests Company" has evicted over 20,000 people from their land in Uganda to make way for tree plantations. Homes were burnt, people, including women and children, were brutalized and murdered during the long eviction process. However, the New York Times states that in this case "the government and the company said the settlers were illegal and evicted for a good cause: to protect the environment and help fight global warming." The "group" the New York Times is referring to is Oxfam, which published a report titled, "The New Forests Company and its Uganda plantations," detailing the activities of New Forests in Uganda and the evictions the New York Times gingerly describes in its article. Who is The New Forests Company? Meet "New Forests," a UK-based firm that claims to be a "sustainable and socially responsible forestry company with established, rapidly growing plantations and the prospect of a diversified product base for local and regional export markets which will deliver both attractive returns to investors and significant social and environmental benefits." Their corporate website is not short of the color green, nor of African people smiling and prospering, so apparently, we are left to believe, New Forests has made good on their mission statement. 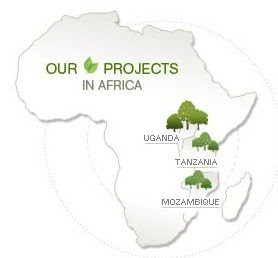 Image: Taken from New Forests' website, they proudly display the swath of destruction their company is responsible for, of course, instead of depicting the displacements, murders, and thuggery they are committing against the people of Africa, they place images of thriving trees. Meet Robert Deveruex, chairman of New Forests, one of the founding shareholders of The Virgin Group and former chairman of Soho House Group. He has spent a great deal of time and energy making what his corporation is doing in Africa appear to have a philanthropic spin. 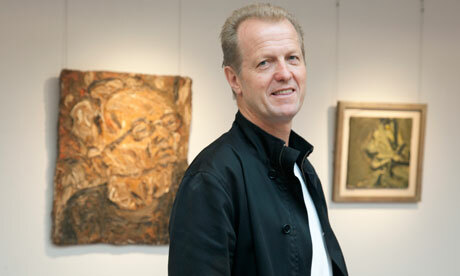 In an August 2010 Guardian article titled, "Robert Devereux donates £4m of art collection to set up African charity," Devereux claims of his New Forests company that it "has a huge community development programme. It's not philanthropy. We go to the community and we say, 'We want to co-invest with you. If you provide what labour and materials you can, we'll provide money for things that you can't get.'" Devereux, however, never mentioned what happens if the community says, "no thanks." Photo: Robert Devereux, a long time investor, a long time con-artist spinning his company's despoiling of Africa as some sort of cutting-edge investment strategy that makes money and "helps" people. Even as Devereux made his disingenuous statements in 2010 regarding New Forests, the villagers in Uganda he was "helping" had already filed a court case a year earlier protesting the British company's encroachment on their land. Meet New Forests executive director and CEO Julian Ozanne, who previously worked for the Financial Times, advised US and European investment banks on business and political risk in Africa and worked for the global corporate-fascists nexus, the World Economic Forum. Also serving as a New Forest director is Jonathan Aisbitt, chairman of the investment firm, The Man Group, and previously a partner and managing director at the now notorious Goldman Sachs. There is also Avril Stassen, who is not only a director at New Forests but is also currently a principal at Agri-Vie Investment Advisers, which claims to be "focused on food and agribusiness in Sub-Sahara Africa with a mission to generate an above average investment return, as well as demonstrable socio-economic development impacts through its equity investments in food and agribusinesses." In other words, buying up land in African nations people depend on to live, to instead broaden foreign investors' portfolios and profits, all under the cover of feel good rhetoric and pictures of smiling Africans pasted all over their website and annual reports. A good website that seems to be keeping watch on Agri-Vie is Farmlandgrab.org, which in one short URL explains exactly the game Agri-Vie is playing. And finally, meet Sajjad Sabur, also a director at New Forests, as well as a managing director at HSBC, heading the mega-bank's "Principal Investments Africa" branch which targets African businesses with management buyouts, growth capital and recapitalization "opportunities." Sabur's HSBC invesment arm has actually invested in New Forests. Quite clearly, this looks more like the profile of a Wall Street-London corporate-fascist hit team than anything at all involving humanitarian, environmental, or social concerns. And judging by Oxfam's report and the subsequent attempt by the New York Times to mitigate the gravity of what the largest banks in the world are doing to Africa, it seems like a corporate-fascist hit is just what is unfolding in Uganda at New Forests' hands. Backtracking to New Forests' mission statement, apparently "social responsibility" equates to murdering or displacing tens of thousands of Ugandans in their own nation, and "attractive returns" equates to the extraction and exportation of Ugandan resources for a corporation's shareholders 4,000 miles away. What we are told is of significant "benefit" to society and the environment looks more like a textbook case of imperialism, perpetrated by British, surely new to being socially and environmentally responsible, but certainly not to imperialism nor gimmicks used to mask it behind noble causes. The New York Times reveals that the World Bank is also an investor in New Forests along with HSBC, and that the true nature of the scam goes beyond merely displacing tens of thousands to grow trees, but that the trees are being used for the purpose of selling contrived carbon credits, not even to provide tangible resources for economic activity. The New York Times also implicates the United Nations, which granted New Forests permission to "trade" with the Ugandan government regarding its 50-year lease to grow trees in the landlocked nation. The government of Uganda, led by President-for-life Yoweri Museveni for the last 25 years, was the result of a protracted civil war led by Museveni himself. After seizing power, he was immediately lauded by the West, embraced the World Bank and International Monetary Fund's plans for restructuring his newly conquered nation, and has been running it as a dictator ever since. It is no surprise that Museveni is now selling his own people out, no doubt in exchange for his perpetual, unhindered rule, transiting a vast corporate media black hole enjoyed by regimes servile to Wall Street and London worldwide. The globalist New York Times has a long tradition of apologizing not just for Anglo-American bankers as they defile the planet, but defending their accomplices, Museveni apparently one of them. In a 1997 New York Times article titled, "Uganda Leader Stands Tall in New African Order," Museveni is praised for his extraterritorial meddling throughout neighboring African states. The New York Times claims, "not only has Mr. Museveni resurrected his own impoverished nation from two decades of brutal dictatorship and near economic collapse, but he is also widely seen as the covert patron of rebel movements like the one that has just toppled Mobutu Sese Seko, the longtime dictator of Zaire." The article then brushes off accusations that Museveni is dictator of a single party system of governance by providing Museveni's own defense, that Uganda is pre-industrial and not ready for multiparty democracy. How resurrected Uganda is from poverty is a matter of debate, and certainly, the concept of poverty has taken on all new dimensions for over 20,000 Ugandans forced from their land by Anglo-American bankers and their willing accomplices in the Ugandan government. How Museveni plans on bringing Uganda past its "pre-industrial" state by handing over land to foreigners to grow trees on for the next 50 years, leaving his own people homeless, jobless, and destitute for an entire generation is also a profound mystery. What we are watching in Africa is the grotesque reality that is globalization peaking through the thick layer of lies, propaganda, spin, liberal ideologies, and imagery used to dupe the Western world, and increasingly many in the developing world. It is a reality that entails theft on a massive scale, human exploitation, mass-murder, collective punishment, and intimidation. For those that think Uganda is an isolated anomaly and are somehow able to dismiss the backgrounds of New Forests which represents an entire network designed specifically to exploit and strip mine all of Africa, one need look no further than Southeast Asia's Cambodia. There, half way around the world from Uganda, another Western backed dictator-for-life, Hun Sen, has literally sold half his country to foreign investors, displacing hundreds of thousands at gunpoint in a nearly identical Wall Street-London land-grab. Globalization is a multi-billion dollar packaged update of the British Empire's "spreading of civilization." Designs of dominion and exploitation have historically always been accompanied by excuses seen as palatable for the masses who were expected to support and carry these designs to fruition for the ruling elite. While it is no longer fashionable to kill black and brown people while accusing them of being "savages," it is still quite fashionable to consider them "undemocratic," "backwards," "overpopulating," "terrorists," and above all, "detriments to our environment." At least, New Forests and New York Times seem to think so. Once again, the choice we the people have, upon learning of this, is to either detach in cowardice and apathy, or identify the corporations, banks, and institutions leading this "globalization," expose them, boycott them, and ultimately replace them. Those of New Forests guilty of displacing, even murdering people simply for profit in a foreign nation, thousands of miles from their shores, don't belong in business anymore. The darkest villains we face on earth today are not cave dwelling Islamic fundamentalists, Libyan colonels, or Americans selling sliver coins, instead, the most dangerous, degenerate, and detrimental members of the human race reside on Wall Street and in London's financial institutions.